Wisconsin-based KI gets high marks for its educational, healthcare, government and corporate furniture, which meet stringent environmental standards. healthcare and corporate markets. 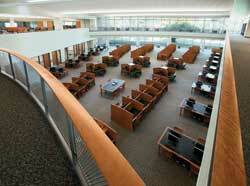 Pictured above is a university media center utilizing CrossRoads library tables, study carrels and chairs. Education is a key component to Green Bay, WI-based KI's success. The half-billion dollar contract furniture company is one of the largest producers of post-secondary educational furniture, as well as a renowned manufacturer of furniture for the government, healthcare and corporate markets. In addition to being one of the largest producers of environmentally friendly certified furniture, KI places a strong emphasis on educating employees and the public about environmental responsibility and good stewardship. Currently, KI has 37 of its furniture lines GreenGuard certified for low chemical and particle emissions, with another 15 to 20 lines expected to be certified later this month. The GREENGUARD Certification Program is a voluntary, third-party testing program for low-emitting products and materials, including furniture. According to Norman Nance, vice president of A&D and Environmental Issues, KI will focus on the largest volume movers first, with the intent of having all lines certified by the end of 2008. According to Nance, although KI formalized its environmental stewardship policy just a few years ago, the company has worked for more than a decade to reduce its impact on the environment. â¢ the use of high solids paints, UV curing and electrostatic powder coating for wood and metal finishing. KI has received numerous awards for its efforts, including the 1995 and 1998 Prevention Environment Prosperity Award presented by the Wisconsin Department of Natural Resources; the 1996, 1998 and 2001 Wisconsin Governorâs Award for Excellence in Hazardous Waste Reduction; the 1997 Wisconsin Business Friend of the Environment Award; the 2004 Business Friend of the Environment Award for Pollution Prevention; and in 2006, the Packaging Reduction Gold Achievement Award presented by WasteWise. According to Seymour, KI incorporates a âReduce, Reuse and Recycleâ philosophy for waste and packaging in all its plants. For example, in addition to reusable plastic totes and shrink wrapping, âWe use returnable pallets, cartoning for raw materials and blanket wrap where possible,â Seymour says in describing some of the methods the company uses to reduce its packaging waste. According to Nance, additional company-wide waste- and energy-saving efforts include: a recycling program for batteries, CRTs and computers from home; and a carpooling incentive program. âWe have had a very favorable response by employees to these programs,â Nance says. âThe next step for KI is to look at each factory and see where there are other opportunities to reduce energy and greenhouse gas,â Nance adds. âOur intent is to reduce VOCs, not only in the community, but also in the plant." âWe will look to transition not only our manufacturing standards to environmentally friendly, but also our material processes. Weâve already eliminated VOC adhesives from the product line by using hotmelt or water-based adhesives for everything. 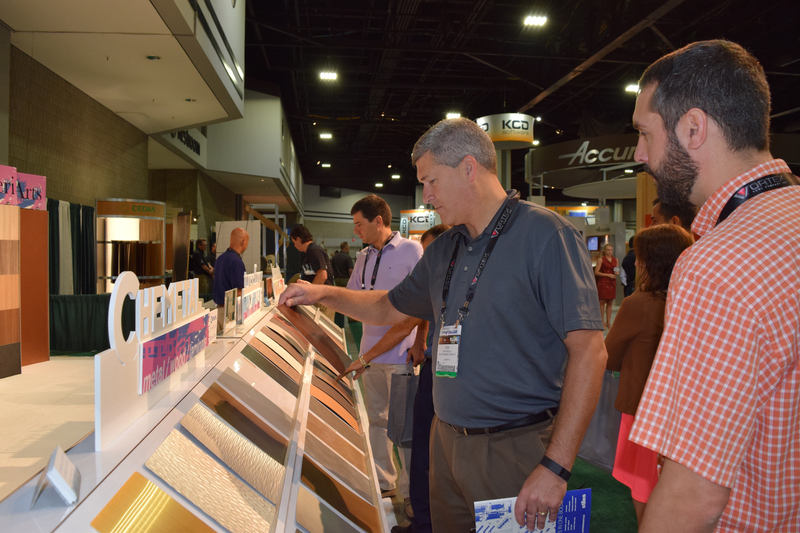 The laminating process also uses water-based adhesives,â Nance says. The LEED (Leadership in Energy and Environmental Design) Green Building Rating System focuses on five areas in promoting a whole-building approach to sustainability: materials selection, indoor environmental quality, water savings, energy efficiency and sustainable site development. In addition to LEED for commercial interiors projects (LEED-CI), there is a LEED program for schools and one under development for homes and healthcare. Those using GREENGUARD or other approved products in their projects can receive credit toward LEED certification. The Xylon Chair used in this cafeteria features a movable back, plus a contoured seat and back for added comfort. According to Bob Stefan, sales specialist, the goal of KI is to balance the aesthetic and functional needs of the client, while at the same time producing furniture with little or low chemical and material emissions to meet todayâs environmentally friendly requirements. âWeâre seeing both schools and commercial buildings becoming more environmentally conscious,â Stefan says. âA lot of it is being driven by the A&D community and the fact that end users want to be more environmentally conscious. On the educational front, a lot of students are becoming a driving force behind sustainability â it is their ârally cryâ or issue,â he says. âKI has listened to what the students and administrators are saying and weâve reacted as a company,â he adds. In addition to its environmental efforts, KI also distinguishes itself through its âMarket of Oneâ process which treats customers as individual âmarketsâ by customizing any product line or service to their needs. According to Stefan, the KI Instruct Series of teachersâ desks was developed as a direct result of the sales representative listening to the customer and using the Market of One process. âIt happens all the time. We have our ear to the ground â we not only listen to our customers, but our customersâ customers,â Stefan says. In addition to being environmentally friendly, he adds, educational and institutional facilities are looking for ways in which to aesthetically combine the softness of wood with ease of maintenance. âA lot of times, they will combine a laminate surface with wood edgebanding and a wood veneer modesty panel â you see this quite a bit in educational projects,â he says. Stefan also notes a trend back toward darker colors, such as walnut, in residence hall furniture. KIâs recently redesigned showroom in Chicagoâs Merchandise Mart highlights the companyâs offerings, not only for educational furniture, but also its products for other core markets: government, healthcare and corporate. At the recent NeoCon show, the educational vignette in KIâs showroom featured furniture geared not only for individual study, but also for the interaction between faculty and students as well as for socialization outside the classroom. Among the items on display were KIâs All Terrain tables and Torsion on the Go! chairs for the classroom, and the RAvDO tables and Ivey, Relax and Tea Cup chairs for socializing in the lounge. âIn educational furniture, mobility is a big factor. Furniture needs to be liquid, and having products for multi-use applications is key,â Stefan adds. KIâs InTandem Table System offers flexible configurations and is available in a variety of table depths and leg heights, with flip-down doors offering convenient access from the front or back. Because KIâs products are not commodity items, competition from low-cost imports has not been a factor in company sales, Ganiard says. Most of the customization is derived from work surfaces, which allow for choices in the veneer, laminate or grommet selection, or in the base itself. Because the company has separate facilities dedicated to woodworking, metal and plastic forming and fabrication, custom orders can be handled easily. All the plants adhere to the lean manufacturing techniques and produce product to order, on a just-in-time basis, Seymour says. Of the companyâs core product lines, 15 percent include wood or wood products, with metal and/or plastic comprising the remaining 85 percent. KIâs plants are designed for product cell manufacturing, ânot process,â and productivity is tracked by teams, with quality control performed during each step. âItâs a process of continuous improvement,â she says. In order to reduce potential downtime or bottlenecks, employees are crosstrained in the various manufacturing processes. In addition to the wood machining operations, the company also has the capability to laminate and veneer panels, finish and assemble. For metal components, the companyâs plants incorporate machines for metal forming and plating, as well as powder coating lines for finishing. As part of its waste-reduction programs, KI recently installed a reclaim system for the plating line which extracts the nickel metal alloy from the sludge and conveys them to the recycler. KI also does its own injection molding and will regrind its plastic waste for reuse or recycling.